Keith Tyler Crowe, son of Jimmie and Charles Crowe. Keith Tyler Crowe, age 47 of Chattanooga, TN passed away at his home Monday April 27, 2015. A Memorial Service will be held at 11:00AM Saturday May 2, 2015 from the Chapel of Darby Funeral Home with interment to follow at Old Macedonia Campground Cemetery. Mr. Eddie Starrett, Mr. Russ Starrett and Pastor David Sternberg will officiate. Visitation hours are from 9:00AM until the funeral hour. 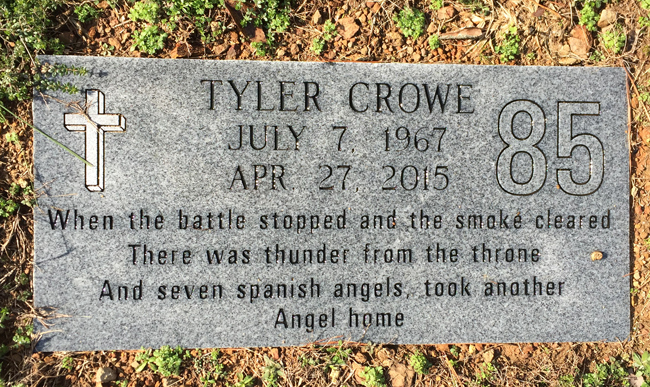 Mr. Crowe is survived by his son; Zachary Tyler (Ashley) Crowe, Onalaska, WI, mother and father; Jimmie and Charles Crowe, Canton, GA, grandmother; Norma "Grammie" Trantham, Acworth, GA, brother; Ryan (Jami) Crowe, Jasper, GA, sister; Kim (Sean) Lewis, Cartersville, GA. In lieu of flowers please make donations to the Tyler Crowe Memorial Fund at any Wells Fargo Bank nation wide. The caring staff of Darby Funeral Home is in charge of these arrangements.